Two brothers kill each other. Authorities — afraid of losing power, influenced by familial disagreements — determine that one brother is worth mourning and the other is not. Everyone tries to do the right thing and society is ripped apart, a family destroyed. 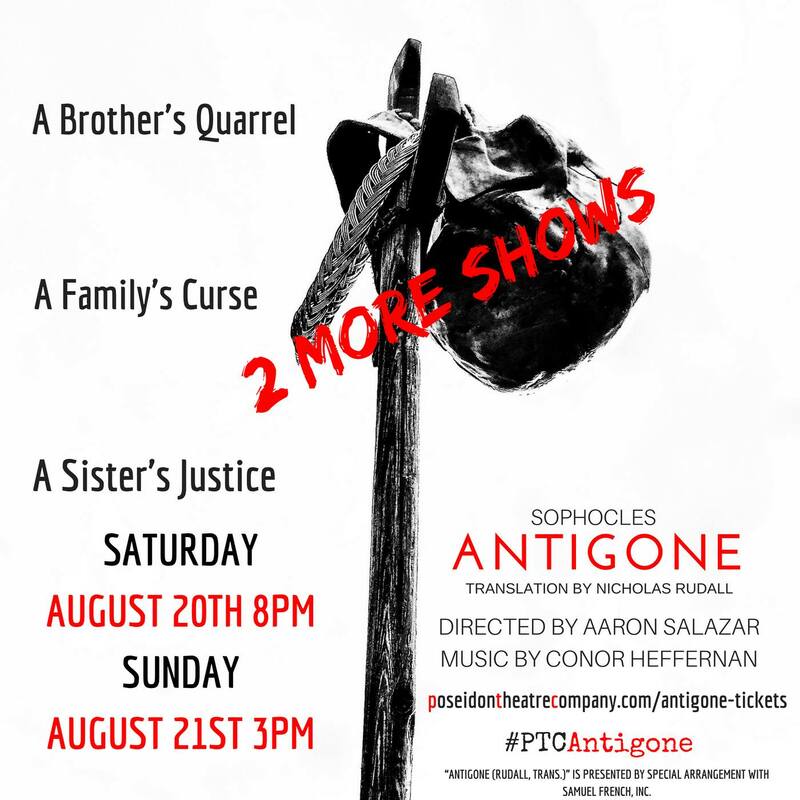 The recent Poseidon Theatre Company presentation of Antigone (my pal Aaron Salazar directing in the company’s first production) powerfully expressed the anguish and strength of the sisters Antigone and Ismene’s struggles with family, with law and with their gods, as they attempt to honor their brothers in a time of tragedy. Elegant and spare, the production was lovingly and expertly composed. A rhythmic tidal, tribal soundscape starting before the action begins lent a tension and emotional tautness to the entire play. Projected images of boys playing and fighting in the woods and by the sea created a mythical tone and provided a gentle but forceful reminder to the audience of the expositional tragedy at the center of the play. The four corner staging was expertly exploited by the chorus and players. And, of course, Sophocles’ dialogue speaks from the ages with clarity and strength to the depths of our being. 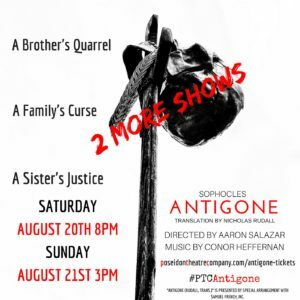 Greek tragedy – done well, like this staging was – provides an intense spiritual cleanse. Congratulations to the entire company – everything was superb. More!! !